Water is one of the basic necessities of human life. This simple fact provides for just about the most secure business model one can find—water utilities. Even in the direst of economic climates, people simply cannot live without water. This is why so many publicly-traded water utilities have paid—and raised—their dividends for decades on end. For example, California Water Service Group (CWT) has paid 288 consecutive quarterly dividends, a streak that amounts to 72 years. And, it recently increased its shareholder dividend for the 50th year in a row. This landmark accomplishment vaults CWT into the rarified air of the Dividend Kings, a select group of companies with 50+ years of consecutive dividend increases. With the inclusion of CWT, there are now just 19 Dividend Kings. You can see the entire list of Dividend Kings here. This article will discuss CWT’s business model, future growth prospects, and valuation of the stock. CWT is the third-largest publicly-traded water utility in the U.S. The company has six wholly-owned subsidiaries, which provide water in California, Washington, New Mexico, and Hawaii. Four of the six subsidiaries are regulated by their respective state public utilities commissions. The company also has non-regulated operations in water utility and wastewater systems, and related services. CWT currently has more than 500,000 customers, and generates more than $400 million in annual revenue. Over the course of 2016, CWT’s earnings-per-share were pressured by higher interest expense, and various non-recurring cost items. Still, the company remained highly profitable throughout the year. 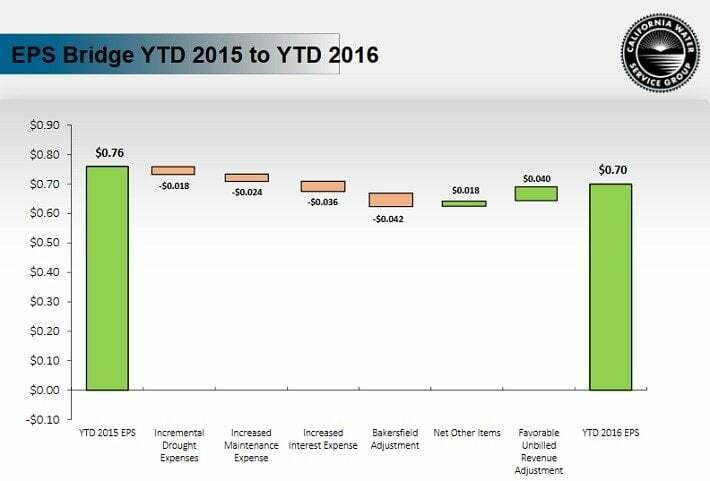 The company generated earnings-per-share of $0.70 during the first three quarters of 2016. Earnings-per-share sufficiently covered its dividends of $0.54 per share in the same nine-month period. The water utility business is not a growth industry. That being said, CWT should be able to grow revenue and earnings moving forward, due to customer additions, and favorable rate outcomes. CWT was recently awarded a 50-year contract with the U.S. Department of Defense to provide water to the Travis Air Force Base. This will add roughly 15,000 customers. In addition, rate increases will help boost revenue going forward. Since CWT is a regulated utility, it receives approval for rate hikes on a regular basis. The company’s 2015 rate case provides an opportunity for $78 million in new revenue from 2017-2019. This has allowed CWT to generate a steadily-increasing rate base over time. CWT’s earnings-per-share fell in 2016 and 2015, as the company took on debt to invest in modernizing its assets. This caused the company to incur higher interest expense and higher levels of capital spending. However, analysts expect the company to return to growth going forward. On average, analysts are forecasting 50% earnings-per-share growth in 2017, which would effectively offset the declines over the past two years. The main competitive advantage for CWT is its industry, which has a very wide economic moat. This is a term, often used by value investors like Warren Buffett, to describe companies with impenetrable business models. The utility industry is extremely capital-intensive. This, coupled with the high regulatory hurdles of providing water, greatly insulate CWT against competitive threats. As a result, CWT has a remarkable ability to remain steadily profitable, even when the economy goes into a downturn. After all, everyone needs to use water for drinking and bathing, even during recessions. From 2007-2009, during one of the worst economic recessions in the U.S. since the Great Depression, CWT grew its earnings-per-share by 31%. The one downside of CWT stock is valuation. Over the past few years, investors have bid up share prices of dividend stocks, due largely to low interest rates. The investment case for CWT is simple. The business model is easy to understand, which leads to predictable earnings. And, it is regulated, which results in less volatility. Investors have rewarded CWT’s stability and consistency with a high valuation. CWT stock trades for a price-to-earnings ratio of 39 based on its earnings-per-share of $0.88 over the past four quarters. By comparison, the S&P 500 Index trades for an average price-to-earnings ratio of 26. Since 2000, CWT stock traded for an average price-to-earnings ratio of 23. Based on the S&P 500 multiple and CWT’s own historical average, the stock appears to be significantly overvalued. As a result, investors should wait for a better buying opportunity before buying the stock. Investors should not expect this slow-growth utility to experience further multiple expansion. Therefore, future returns will be made up of earnings growth and dividends. As a result, investors can reasonably expect CWT stock to return 6%-8% per year going forward. One reason for the fairly modest return forecast, is that the stock dividend yield has fallen to 2%. This is because of the rising share price, and shows the cost of buying stocks after prolonged rallies. At first glance, it might come as a surprise to see CWT make the list of Dividend Kings. It’s a very small company, with a market capitalization of just $1.25 billion. But when it comes to the Dividend Kings, company size isn’t the most important thing—a strong business model and durable competitive advantages are more important. This is why, even small companies can make the list. Take Farmers & Merchants Bancorp (FMCB) for example. It has a market capitalization of just $500 million, but still made the list of Dividend Kings in September 2016. CWT is a highly profitable company, in an industry that will be around as long as humans exist on the Earth. The only downside to the stock is its valuation, which is high. Still, while CWT may not be an exciting company, it will continue to be a reliable dividend growth stock.